Cancers driven by mutations in the KRAS gene are among the most deadly. For decades, researchers have tried unsuccessfully to directly target mutant KRAS proteins as a means to treat tumors. Instead of targeting mutant KRAS itself, researchers at University of California San Diego School of Medicine are now looking for other genes or molecules that, when inhibited, kill cancer cells only when KRAS is also mutated. 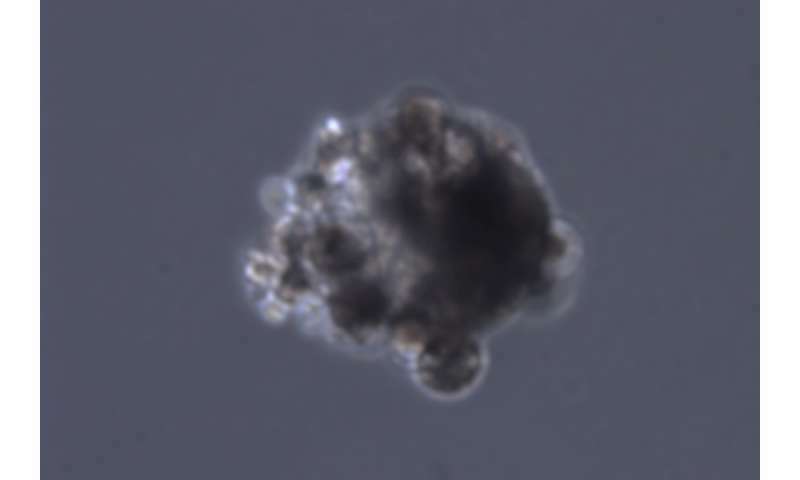 The team used the CRISPR-Cas9 gene editing technique to systematically inactivate every gene in the genome of human colorectal cancer cells with and without mutant KRAS. They found that growth of KRAS-mutant colorectal cancer cells in mice was reduced by approximately 50 percent when two genes that encode metabolic enzymes—NADK and KHK—were also inactivated. "We did not get these same results with cancer cells grown in the lab—the growth inhibition we saw when the NADK and KHK genes were inactivated only occurs in tumors in a mammalian system, in a more realistic microenvironment where the tumor has to survive," said senior author Tariq Rana, PhD, professor of pediatrics at UC San Diego School of Medicine and Moores Cancer Center. "That suggests that the metabolic dependencies of tumor cells growing in a laboratory dish may differ dramatically compared to the same cells growing in a living system, underscoring potential limitations of standard laboratory-based cancer cell growth tests." Rana's approach to treating KRAS-driven cancers—inhibiting other genes or molecules in addition to KRAS—is called "synthetic lethality" because the intervention is only lethal to the mutated cells. In a previous study, Rana's team used a library of microRNAs, small pieces of genetic material, to systematically block protein production and look for those inhibitions that are synthetic lethal in combination with KRAS mutations. In their latest study, Rana's team used CRISPR-Cas9 to systematically inactivate genes in two human colorectal cancer cell lines—one with normal KRAS and one with a mutant KRAS. They then tested the ability of each of these cell lines to grow as tumors in mice. They found that inactivating two metabolic enzymes, NADK and KHK, reduced the growth of KRAS-mutant tumors by approximately 50 percent, but had no effect on normal KRAS tumors. They also blocked these same enzymes with commercially available small molecule inhibitors and saw significant reduction in tumor growth in mice only in tumor cells with mutant KRAS. Rana and team also identified several new genes that, when inactivated, had the opposite effect—they increased KRAS-mutant tumor growth, but not the growth of normal KRAS tumors. These types of genes are known as "tumor suppressors" because they normally keep cancer cell growth in check. "One of the most surprising findings from our study is how performing this type of genetic screen directly in a mammalian microenvironment revealed not only new synthetic lethal interactions, but also new tumor suppressor genes that are dependent on KRAS mutations," said first author Edwin Yau, MD, PhD, a hematology/oncology and Cancer Therapeutics Training Program fellow in Rana's lab.